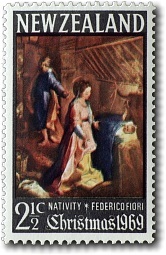 The 1969 Christmas stamp features 'The Nativity', a painting by Federico Fiori. The stamps were printed on multiple NZ and star watermarked paper and unwatermarked paper. If you have any questions or comments please contact us - we'd love to hear from you.